Thanks to everyone who has been visiting lately! I am so excited to see new readers thanks to the Ultimate Blog Challenge. If you are a fellow blogger, check it out. There's still time to join or you can think about getting on board in January. It's a great personal challenge and way to connect with other bloggers. Here's a peek at what we did last year. Every year we head out to the pumpkin patch, one of our favorite fall activities! After we each pick out a pumpkin, feed the goats and eat some ice cream, we bring our treasures home. Sometimes we carve and sometimes we paint. As you can see from the pictures, last year we painted. The pumpkin above is my husband's artistic creation. Funny enough, he did an eyeball two years in a row. And even funnier, it didn't dawn on him that this was a repeat until the pumpkin was nearly complete. He's got a theme going! The pumpkin below is my daughter's creation. She chose a batman theme. Cute, right? At the time I didn't even know she was into batman. Go figure. My daughter is all about trying new things whenever she gets the chance. She's always open to a new experience and when she gets bored she likes to try the next new thing. Right now it's soccer and unicorns. She really is a fun person. My son went with a classic Halloween monster, complete with bloody tooth. I think it's a zombie. He's really quite the good artist. He's the kid who likes to make everything on his own including Halloween costumes. We were in the store just the other day and came across some pretty cool costumes. He even tried some on. When asked if he wanted one, his response was, "I think I just want to make my own". If you remember the lobwhale, you'll see that this unique creativity is classically my son. I chose to paint two gourds this time. I'm pretty sure my pumpkin rotted by the time I got to it! So, gourds it was. I must have been feeling feminine that day and went with a flowery, sparkly theme. I think the gourds turned out pretty, but they are a bit out of place with the rest of the bunch! We are each our own unique people in my family. I was talking to my husband the other day about this because my daughter and son are almost opposites in their personalities. This lead to discussion of my siblings and me. While we all share some quality or other, the five of us are distinct. It's funny how people can have such diverse personalities even when their backgrounds are much the same. I guess we all have something different to offer the world. And that's a good thing. 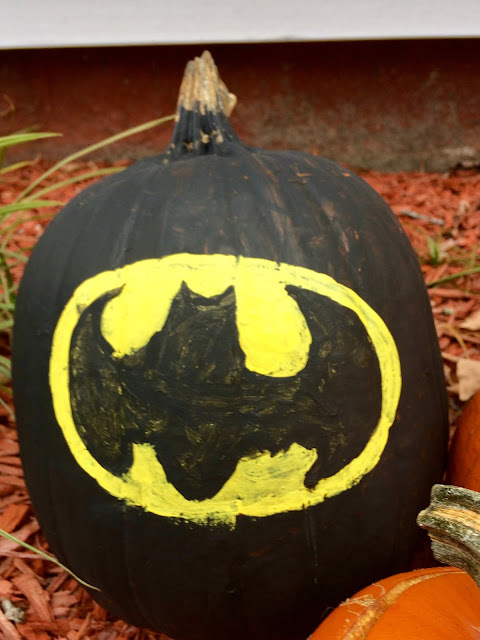 So there you have it, some inspiration for your pumpkins this year. Stay tuned to see this year's creations! I wonder if there'll be another eyeball. I love these. So much easier than carving them. We might paint some pumpkins this year. Thank you, Janet! It is easier than carving. I saw a post about covering pumpkins with fabric. I'd like to try that for something different one year! 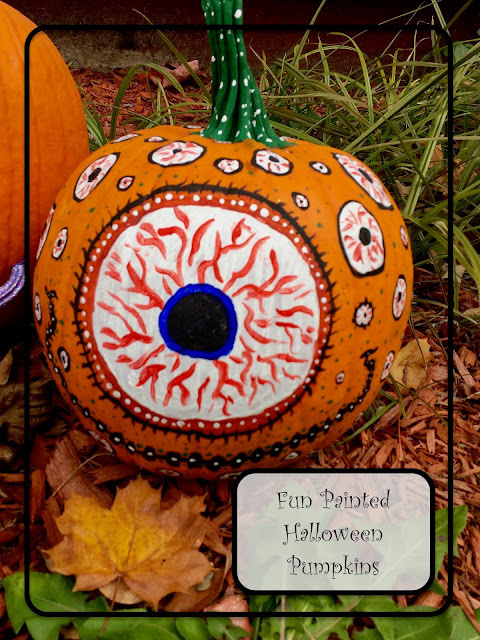 Your painted pumpkins �� look awesome!!! That's a good idea. Do you mean like decoupage? That would be a lot of fun. I may have to try that. So creative! Love the Batman one. I'm going to pass that along to my nephew. Happy Halloween. I hope your nephew enjoys! Happy Halloween! 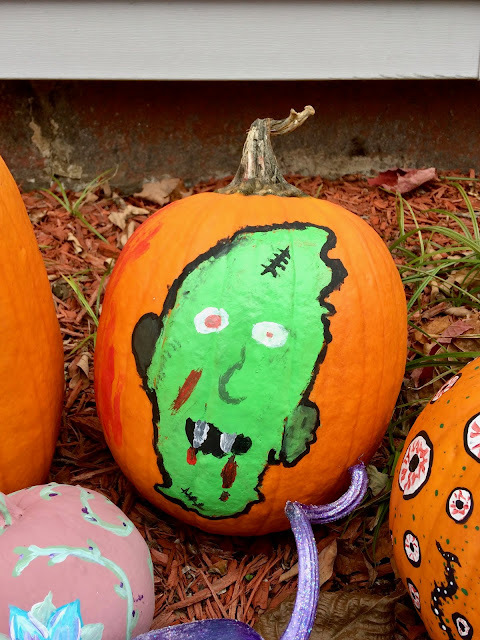 Painted Pumpkins also last longer than carved pumpkins! The problem I have when I put pumpkins on my front porch is that the squirrels come and think it is food for them! They start chewing away at them! We live in a new area with a ton of squirrels and chipmunks this year. I hope we don't have the same problem! 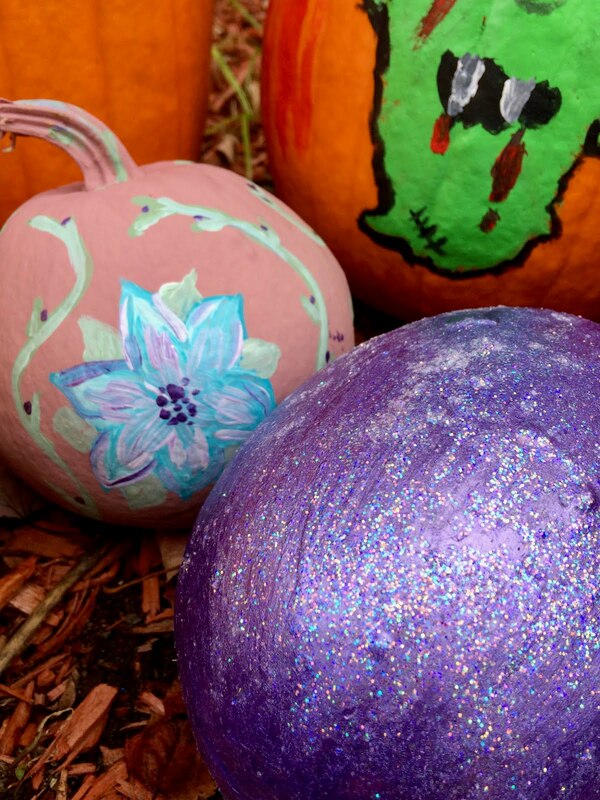 Lovely pumpkins and I like the Glitter pumpkin and blue flower.